Please contact Tree Staple, Inc. at 908-626-9300 to obtain a copy of our Installation Specification. Dig Safely. Please comply with "Call Before You Dig" law requiring utility markouts; the national telephone number is 888-258-0808. Always wear appropriate safety attire, including protective eyewear. Leaving burlap intact, heel the plant's root ball into place. Remove plastic safety caps from Tree Staples™ and set aside. Set each Tree Staple™ opposite the other and against the outside edge of the root ball. The shorter prong should be positioned over the root ball, halfway between the trunk and the ball's outer edge. 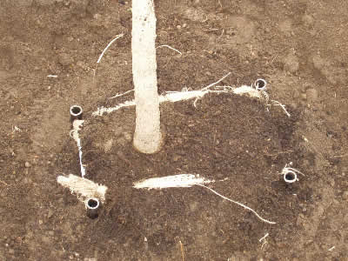 Using a sledgehammer, drive each Tree Staple into the ground until the cross bar is recessed one to two inches below the surface of the root ball. You can alternate between hitting either of the prongs to insure that the Tree Staples are completely below-grade. Place safety caps on exposed ends. Cut back burlap, leaving material under cross bars. Fill and finish planting using best practices. 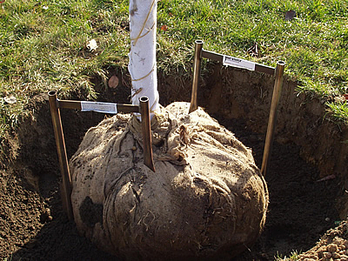 Root ball is small relative to canopy or tree size, (palm trees). Follow steps 1, 2, & 3 in Installation Instructions, changing the position of the short prong to the outside edge of the rootball. Proceed with installation instructions, step #4. "Virtually invisible once installed. Congratulations on an innovative solution!" Copyright © 2003 Tree Staple, Inc. All rights reserved. Tree Staple™ is a trademark of Tree Staple, Inc.